Techno-Sciences' Jean-Luc Abaziou talks about his company and its interest in robotics at the first Techno-Sciences Inc. Robotics Seminar of 2011. 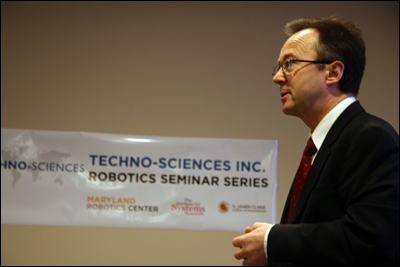 Techno-Sciences, Inc. is providing financial sponsorship for the Maryland Robotics Center’s seminar series, now named the “Techno-Sciences, Inc. Robotics Seminar Series," Maryland Robotics Center Director S. K. Gupta (ME/ISR) has announced. Jean-Luc Abaziou of Techno-Sciences was on hand for the first seminar of the semester on January 28. Before the seminar, he spoke about the company, its relationship with University of Maryland researchers, and its interest in robotics. The seminar speaker was Rogelio Lozano of the Université de Technologie de Compiègne, who spoke on “Hovering Quad-Rotor Control: A Comparison of Nonlinear Controllers Using Visual Feedback." The Maryland Robotics Center thanks Techno-Sciences for this generous sponsorship, which makes the continuation of this community-building colloquia series possible. The Maryland Robotics Center is housed within the Institute for Systems Research in the A. James Clark School of Engineering at the University of Maryland.